Once upon a time in Toronto KFC was actually a tasty, gingery golden brown coloured fast food known as Kentucky Fried Chicken and sold at a chain of take away restaurants called Scott's Chicken Villa. Their coleslaw was made with Miracle Whip, sugar and carrots and the gravy was a delicious stew of thick and lumpy goodness. Master chef and creator Colonel Sanders was a proper old-school eccentric gentleman from small town Indiana who grew so disillusioned with the draconian tax laws of the Internal Revenue Services that he liquidated personal ownership in all Kentucky Fried Chicken chains in America, retired to a feathered red-bricked home in Cooksville Ontario and concentrated on franchising his auric style of deep-fried fowl in the great white north. "In Canada, you don't have to watch for tricksters and shysters," he once said. "You can do things on a handshake." Scott's was part of the Scott's Hospitality empire, founded by the late entrepreneur George Gardiner, which opened its first Scott's Chicken Villa under the Kentucky Fried Chicken banner in 1962 and who also owned a fleet of school buses, hotels, Black's photography shops, and the Manchu Wok fast-food chain before closure in the 1990s. There were over 100 Scott's Chicken Villas in Ontario, all designed with the same retro style slanted roof buildings (some of these unique buildings still house modern KFC franchises) and catering the original recipe flavour that many Canadians still fondly recall. Amazing to think that even as far back as 30 years ago, disgruntled Kentucky Fried Chicken fans from the United States would cross the border just to re-live the "finger lickin'" glory they had grown up with. Sanders had bolted from America to Mississauga in 1965, although he continued to serve as the world wide face of Kentucky Fried Chicken in advertising and tireless personal appearances, rather impressive for a man of his vintage. He retained full control of the Kentucky Fried Chicken brand in Canada until his death at age 90 in 1980. Even though he was complicit in the mass marketing of it, Sanders was openly hostile and extremely vocal about the lack of quality control in favour cost-cutting and money grubbing that he saw sullying the brand he had slaved so hard to build south of the border. He was sued (unsuccessfully) by a group of U.S franchisees when he commented "My God, that gravy is horrible. They buy water for 15 to 20 cents per thousand gallons and then they mix it with flour and starch and end up with pure wallpaper paste. And I know wallpaper paste, by God, because I've seen my Mother make it! To the wallpaper paste they add some sludge and sell it for 65 or 75 cents a pint. There's no nutrition in it and they ought not to be allowed to sell it." One can only imagine the fury of the good Colonel if he saw what a travesty the steroid laced, overpriced KFC menu has since become. Colonel Sanders was a deeply religious, hardworking promoter who valued quality control over profit, marking him a man out of time in the burgeoning corporate environment of the 1970s. Well liked in Canada (amongst other philanthropic endeavours he helped fund the construction of the Trillium Health Centre, Sanders was more bullish in America. He would personally visit random KFC locations and if service and food were not up to his high standards, he would have their franchise licence revoked. Sanders had over time developed that mythical blend of 11 herbs and spices, the now discarded pressure-cooking process, and most importantly the desire to serve diners' chicken fresh, not frozen. 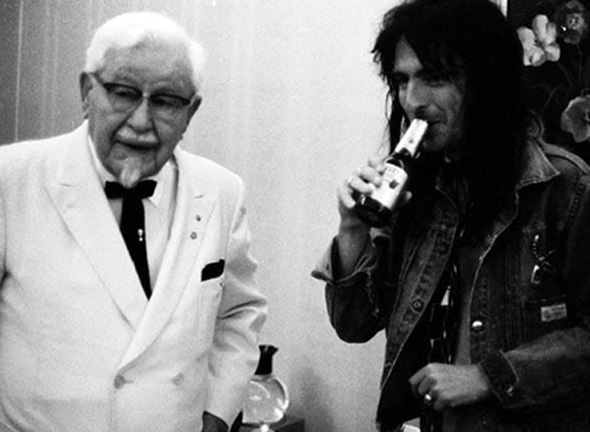 When Pepsico acquired the Canadian Kentucky Fried Chicken Scott's chain in 1987, global brand uniformity was swiftly implemented and the legacy of dirty bird was cast. In the vacuum created by Sander's absence, gimmicks (Oppee), imitation (Nuggets) and heart attack snacks became the norm, culminating in the Double Down sandwich, an ultimate carny styled glut of empty calories and salt that would make even Chris Farley types think twice. It wasn't always so bleak. Admitted fried chicken fiend Dan Aykroyd (http://www.imdb.com/name/nm0000101/) made sure the Colonel's chicken got lots of free product placement in his very first film, the dreary but cheery love story Love at First Sight (1977), which also featured a totally bizarre yet strangely fitting cameo from Sanders himself milling around Niagara Falls. A recent survey from that stalwart of journalistic integrity USA Today revealed that 61% of Americans between the ages of 18 and 25 do not know who the bespectacled, goateed old boy on the KFC logo is. Considering that parent company Yum Brands Inc., have claimed in the past that their initials stand for Kitchen Fresh Chicken, who can blame them?